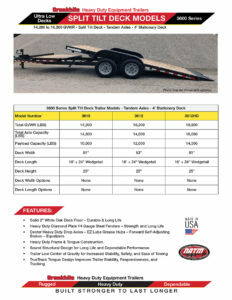 The 3600 Series Tilt Deck Trailer is our top of the line and one of our best sellers. Designed for easy loading, this trailer features a knife edge approach which creates a smooth and level entry point to roll your equipment onto the deck. The 3600 Series has a flush deck. This design allows equipment, attachments, or odd shaped cargo to extend past the trailer frame and still be secured. The 3600 Series is engineered with a pivot tilt point strategically located under the deck. This pivot point allows gravity to gently lower the deck into the loading down position. A hydraulic cushion cylinder provides variable adjustability to the gravity tilt operation. A heavy duty locking latch system secures the deck to the frame for safe and secure transportation. In addition to having a tilt loading deck, the 3610 and 3612 incorporate a Stationary Deck in the front. This fixed part of the deck is 4’ long (5’ and 6’ options available), and is ideally suited for loading equipment attachments like pallet forks, loader buckets, backhoes, and more or palletized material.